The curious history of Mia’s beloved jade mountain, now starring in "Power and Beauty"
In the penultimate room of Mia’s current exhibition, “Power and Beauty in China’s Last Dynasty: Concept and Design by Robert Wilson,” sits a large, greenish rock. The room is dark—and stormy, for that matter, rattled by thunder—and the wallpaper that wraps around it suggests the craggy mountains of Chinese lore. The boulder adds to the mystique, carved into an idyllic country scene that suggests the allure of mountains while belying the true circumstances. The figures communing with the mountain are poets, and they are drunk. The artwork’s full name is Jade Mountain Illustrating the Gathering of Scholars at the Lanting Pavilion. It was carved in 1784, to commemorate this legendary drinking contest that resulted in reams of poetry, and is now one of Mia’s most beloved objects. Robert Wilson, the designer of “Power and Beauty,” plucked it for the show from where it’s stood, more or less, for years, in the corridor between Mia’s Chinese galleries and ancient Greek and Roman galleries. A undated view of the Jade Mountain in the home/gallery of T.B. Walker, in downtown Minneapolis. But a hundred years ago, the 640-pound sculpture served as a table centerpiece. You could do this if you were T.B. Walker, the table was yours, and you owned the jade mountain. 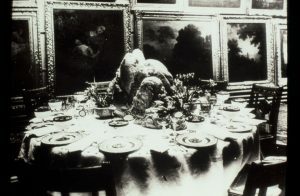 An undated photograph, likely from around 1915, shows the sculpture atop a tablecloth, surrounded by dinnerware and flowers. Herbert Squires, the Secretary of the U.S. Delegation to Peking (Beijing) around the turn of the century, brought the boulder home with him to the United States, where it remains the largest jade carving outside of China. When he died, in 1912, the carving went up for auction, and Walker bought it for $4,000. 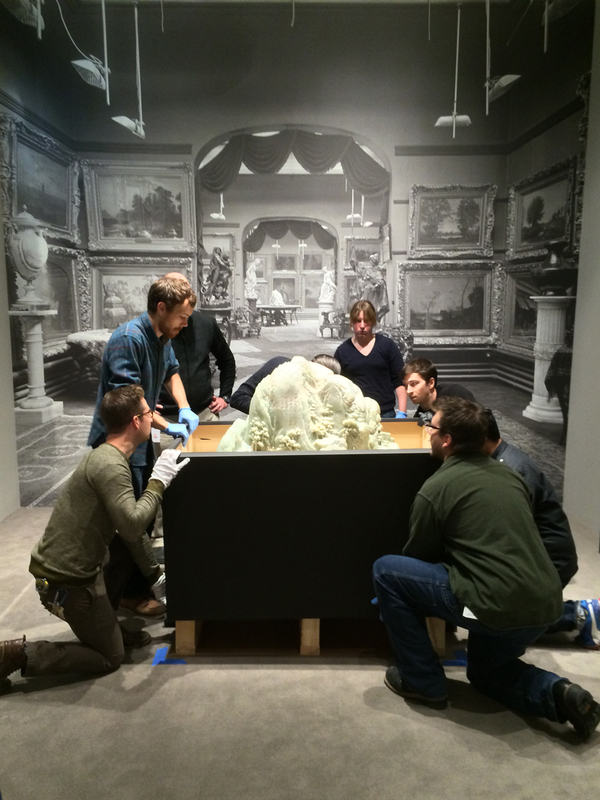 Staff from Mia and the Walker Art Center position the 640-pound boulder in the Walker in 2014, amid a replica of T.B. Walker’s home/gallery. In the photograph, the wall behind the sculpture is almost entirely covered with paintings. Walker owned all of those too, of course. The timber baron had enough art and curiosities to start a museum—two, actually—ranging from Old Masters (many of them fake, as it turned out) to Chinese jades to the death mask of Abraham Lincoln. But before Mia was built in 1915, or the Walker Art Center in 1927, he began Minnesota’s first real art gallery in his own home at 803 Hennepin Avenue in downtown Minneapolis. There were 14 rooms full of art, including a salon just for jade. He liked living among his art, and he wasn’t one to wander: Part of the reason he didn’t just bring his collection to Mia when it opened is that he felt the museum was too far from downtown. The mountain, along with 25 of Walker’s other jade pieces, eventually came to Mia as the Walker Art Center turned exclusively to modern and contemporary art, lending or selling off their namesake’s older works. But in 2014, the mountain returned to its Lowry Hill digs for the Walker’s 75th anniversary celebration. It came back to Mia the following year, for another anniversary—the museum’s 100th.